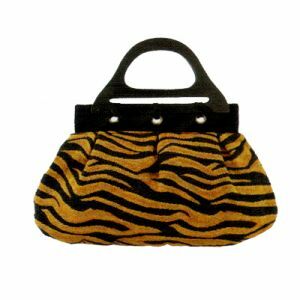 Sassy, stylish, wild Zebra animal print bag will spice up any outfit! Features:Double wooden carry handles accented with 3 black ribbon bow ties on each side. Top zipper leads to spacious single main compartmentInterior includes cell phone pouch & zippered pocket. Measurements:13″W x 2″D x 7″HMaterials: 60% Cotton, 40% Polyester & Wooden handles. It will be your favorite purse!